Dynamic myocardial perfusion imaging is a powerful technique to identify ischemic regions in the heart. A limitation of the current acquisition techniques is that it takes too long to acquire full data in k-space and results in trade offs in coverage of the heart, resolution and signal to noise ratio (SNR). Constrained reconstruction techniques based on a regularization framework [1, 2] have been proposed recently to speed up data acquisitions. The methods [1, 2] achieved high acceleration factors (R~5) reconstructing images from undersampled k-space data. The method  was tested on real radial data that was artificially downsampled. This does not directly correspond to practical acquisition techniques. Here we propose a method for acquiring such data and evaluate the approach. A saturation recovery radial turboFLASH sequence was used and five slices were acquired after each saturation pulse. Unlike the standard turboFLASH sequence in which a saturation pulse is applied before acquiring every slice, using a saturation pulse for every five slices is more efficient, but means different slices have different saturation recovery times (SRTs). Radially undersampled perfusion data for ten slices with 24 projections per slice were acquired on a Siemens 1.5 T Avanto (1 patient) and a 3 T Trio scanner (2 patients). For a given slice the projections were interleaved for different time frames. Representative parameters of the scans were TR = 2.6 msec, TE = 1.14 msec, flip angle = 12, acquisition matrix = 128 × 24, slice thickness = 6 mm and Gd-BOPTA (multihance) dose = 0.03 mmol/kg. Reconstruction was performed by iteratively minimizing a cost function in a similar framework as in  but with total variation constraints in both space and time dimensions. Fig. 1 shows the reconstructed images of ten slices acquired in a single heartbeat during the perfusion sequence. SNRs for the images were computed by dividing the mean intensity of the signal from a region in the myocardium with the standard deviation of intensities from a region in the background. The computed SNRs are shown on each image. Reconstructed images from the undersampled radial data were visually compared to those from Cartesian datasets. Cartesian data for four slices was acquired with R = 1.7 and GRAPPA reconstruction and a 0.015 mmol/kg dose of multihance. Fig. 2 compares the undersampled radial (left) and Cartesian acquisitions (right). Fig. 2a shows images from a patient with known infarct (arrows). Fig. 2b shows images from a different patient without infarct. 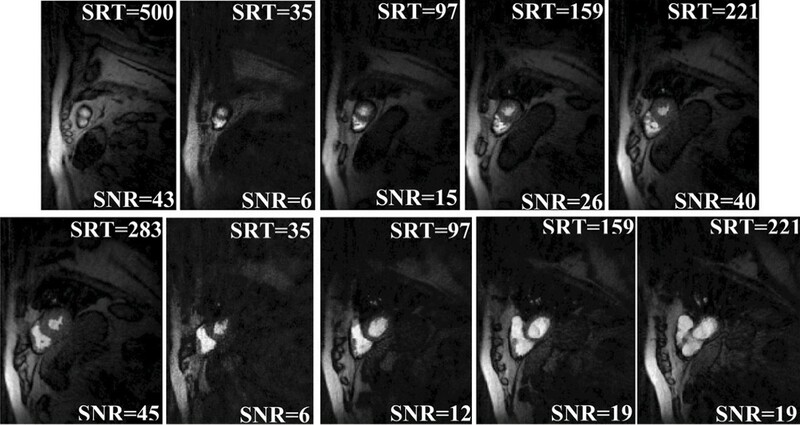 Images of ten slices acquired during a single heartbeat in a perfusion sequence with SNRs and SRTs shown on the images. All the slices were acquired in 644 msec. The images in the top and bottom row are cropped differently to better show the heart. Comparison of recontructions from undersampled radial (left) and Cartesian acquisitions (right). (a) Image frames at a time point for similar slices from a patient with known infarction (pointed by arrows). (b) Image frames at a time point for similar slices from a different patient with no infarction. Using a single saturation pulse for acquiring multiple slices results in different intensities for different slices. This may not be a problem for most slices as the slices can be analyzed separately and can be scaled to have similar intensity ranges. Feasibility of this type of acquisition has been reported using an R = 2 SENSE reconstruction with a saturation pulse every four slices . However, the first slice acquired after each saturation pulse has relatively poor SNR. This slice might be used to obtain a quantitative input function . The reconstruction method is robust to respiratory motion and the images in Fig. 1 were acquired with shallow breathing. The method here is applied separately on each coil data although it can be extended to perform joint multi-coil reconstructions by using coil sensitivities information. The method can be used to improve the diagnosis of myocardial perfusion by acquiring increased number of slices per heartbeat or obtaining increased spatial/temporal resolution.